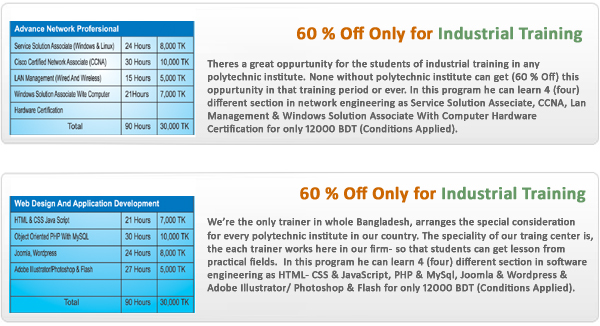 ..:: Training Center | RedGreenBD ITS ::..
Great training can do much more than get new people up to speed quickly. The training center of RedGreenBD IT Solutions provide a dynamic, interactive learning environment and better manage audience participation. We offer built-in tools to engage learners and maximize information retention. RedGreenBD IT Solutions is one of the oldest institute in the information technology (IT) training industry. Over the last 05 years DCCL has proved itself to be the best in IT training in Bangladesh through quality, dedication and sound customer service. We guide you through all stages of your learning life-cycle. As a learning solutions provider for many of the industry's top vendors, RedGreenBD IT Solutions is positioned to offer the latest authorized curriculum delivered by certified instructors to keep you on the cutting edge of technology. Whether you are searching for an answer for the complex training needs of a large, multi-location business, or an individual seeking the skills to excel in a new or expanding career path, RedGreenBD IT Solutions is your integrated learning solution. Integrated Approach Of Learning : In addition to our excellent Instructor Lead Training, our Online LIVE permits ultimate flexibility in training enabling students to gain access to tutors and classes anywhere.